Knowing how to hem jeans is different than hemming a skirt, dress or dress slacks. 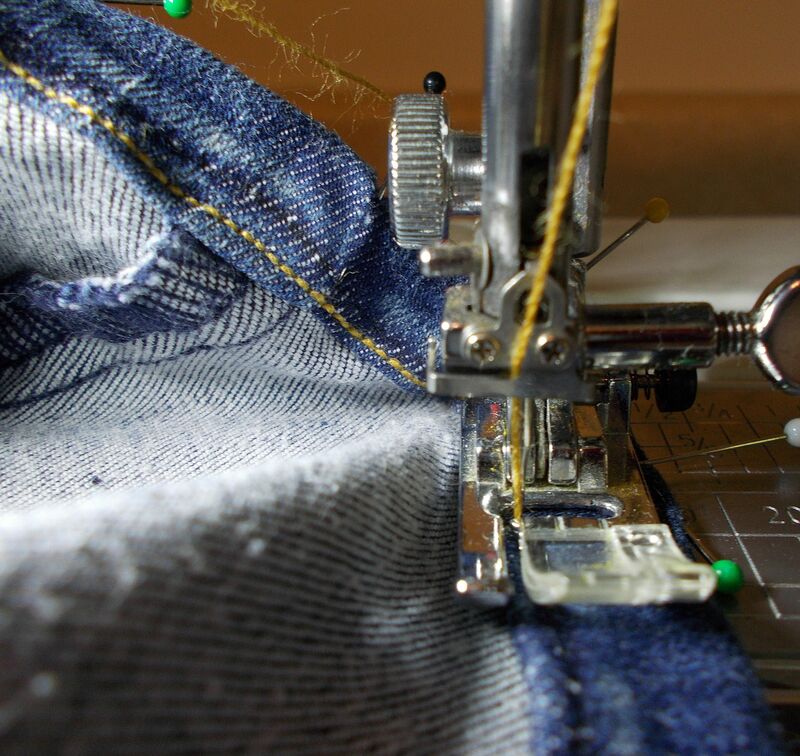 Jeans and many casual garments have a narrow, turned under, visible hem which is easy to replicate with sewing machine and a little sewing experience. Most skirts, dresses and dress slacks have a one to two-inch hem and the stitching that is holding the hem in place is pretty much invisible from the right side of the garment. If these are brand new jeans, just as you would preshrink fabric before you sew it, wash and dry the jeans using the method you will use to launder the jeans. Your goal is to have all of the shrinking done before you hem the jeans. NOTE: Lengthening jeans are different and you should prep the jeans before you begin by removing the hem before you shrink the jeans. Always prevent fraying before laundering and preshrink the trim or "facing" tape you will be adding to the jeans when you shrink the jeans. A basic sewing kit should help you finish this task. Sharp Scissors - Very sharp Dressmaker Shears that are only used for fabric will do the best job. Try on the jeans and put on the type of shoe that you would normally wear with the jeans. The shoes should have the size heal and sole that you would normally wear with the jeans so they will end up the correct length for your shoes. Most people want their jeans long enough to cover the shoes but you do not want the hem to drag on the ground or the material will wear away and leave a frayed mess. Stand up straight and have someone else mark the desired length. Placing a pin perpendicular to the ruler, mark the hem an even distance from the floor. Take off the jeans and turn the marked hem up. Try the jeans on again and be sure you are happy with the marked length. Repeat the process if you are not happy with the length. Place the straight pins in the fold line of the hem. Place as many as needed to securely mark the hem fold. If you will be using the fabric that is in the existing hem (the existing hem is within an inch of your marked hemline) remove the existing hem and press the fabric perfectly flat. Be sure any side seam allowances,- that are not ​flat felled seams, are pressed in the same direction that they are at the waistband. Mark one inch from the hem fold line, toward the bottom of the jeans leg. Recheck this measurement to be sure you are accurate. Cut the excess material off at the newly marked 1" line using sharp fabric scissors so that you obtain a clean crisp cut without fraying the fabric. Fold up 1/2" of fabric, bringing the wrong sides of the fabric together and the raw edge up to the marked hemline inside the pant leg. Press very well. Press the new hem very well using any pressing tools needed to create strong, crisp pressed folds. Use a press cloth to prevent causing a "shine" on the fabric. Pin the hem in place, matching the seam lines so that it does not twist as you sew it in place. Your goal in sewing the new hem is to replicate the manufactured hem as closely as possible. Using the thread that was used by the manufacturer will help you replicate the original hem. Investing in the denim thread that matched your task is well worth the investment. To sew the hem in place, use a seam guide to sew as close to the upper folded edge as possible. Using needle position and a presser foot seam guide together, while not watching the sewing machine needle as you sew, allows you to sew a straight line of stitching close to that edge. You want the stitching as close to the edge as possible to prevent the hem from turning up on its own as it would if the stitching is not close to the folded edge. Trim the threads and press the hem again. Your jeans are now ready to wear and launder, hopefully for many years. How Do I Make a Foot Covering for a Halloween Costume?